Learn more about nutrition facts of different types of foods, and other tips and information about how to maintain a healthy, balanced and nutritious diet. Bitter melon, otherwise known as karela or bitter gourd, is a plant with quite a unique fruit that offers great health benefits. As the name suggests, bitter melon does actually have a very bitter taste which is probably why it’s not the most popular fruit out there. One way to take advantage of the strong nutritional profile of this fruit without actually eating it is by taking bitter melon extract capsules. We’ve had a look at some of the best bitter melon extract supplements available on the market and have selected our top five. Most of us are aware of the many health benefits of probiotics. These microorganisms have been featured in research and countless studies, demonstrating numerous benefits for our health. Probiotics essentially perform the same important functions as the bacteria we find naturally living in our digestive system. When preparing green smoothies, I always look at ways to easily add extra ingredients. Not just for the flavors, but more so because of the extra nutrients I get to enjoy. My most-used green smoothie ingredients, such as kale, carrots, berries, parsley and avocado, are perhaps not very exciting. But some of my favorite smoothie add-ins, that I often use to maximize my nutrient intake, are a bit more surprising and can sometimes even raise a few eyebrows! Please note that all of these add-ins have their own unique flavors so it requires a bit of experimenting to work out what your preferred smoothie balance is. Ever since my first visit to the land of the rising sun, Japanese food has been my favorite international cuisine. The simplicity, the bright colors, the freshness, the unique flavors, I could literally eat Japanese food every day. Food is an important part of Japanese culture, so much so that the UN officially included Japanese cuisine, otherwise known as “Washoku”, in the UNESCO Intangible Cultural Heritage List. This is an acknowledgment of the significance of Japanese cuisine, not just in Japan but around the world. Single serve blenders are the perfect solution for those that want to prepare easy smoothies on the go, but don’t want to invest in an expensive blender with too many unnecessary features. These compact-sized blenders are designed with convenience in mind, so you can quickly prepare a healthy drink without too much effort. We’ve had a look at some of the best single serve blenders available on the market today and have selected our top six. One of the most popular and hyped up health foods from recent years is spirulina. Some say it’s a fad that will just disappear as time goes by, others say it’s the greatest thing since sliced bread. I usually don’t get too excited about just one food in particular. Rather, I prefer to focus on maintaining a healthy balanced diet, eating a wide variety of different foods that all offer their own unique sets of nutrients and health benefits. But there’s no denying that spirulina has a very rich nutritional profile. So much so that I use spirulina powder as a regular ingredient for my green smoothies. It’s just very convenient for me to add a teaspoon of spirulina powder each time I prepare a smoothie and enjoy its health benefits that way. Let’s have a closer look at what spirulina actually is and what some of the best spirulina powder supplements are. Kale is not everyone’s favorite leafy green, but it is definitely one of my most used green smoothie ingredients. Not only is kale a very nutritious vegetable, it’s also a smoothie ingredient that blends really well with fruits and other greens. This is why I’ve selected 8 delicious kale smoothie recipes that will hopefully inspire you to consume more of this powerful vegetable and take advantage of its health benefits. In this day and age where healthy nutrition is such a big industry, should we rely on dietary supplements and presumably healthy green powders to live a healthy life? Or are these often heavily marketed products just a temporary fad? The Athletic Greens Ultimate Daily all-in-one green powder supplement is one of those green powders that has become popular in recent years. 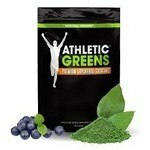 So I made the decision to try Athletic Greens myself for a month to see and feel what it’s all about. Read on to learn more about what’s inside this product, what it tastes like, whether it actually works and what kind of impact it had on my energy levels and overall well-being. Whey protein powder is a popular supplement that typically helps with building lean muscle and supports the recovery process after a workout. As there are literally hundreds of whey protein powders available on the market, it’s difficult to figure out which type of supplement is best for you. While some prefer to consume protein from natural food sources, for others a whey protein supplement is a better solution. If you’re looking for the healthiest protein powder, make sure it’s a natural product with no nasty ingredients. To help you with your search, we have short-listed 6 of the best all natural whey protein powder supplements, based on price, protein content and ingredients. We all know that consuming fruits and vegetables on a daily basis plays an important part of a healthy lifestyle. Despite being aware of this, many find it challenging and time-consuming to incorporate them into their diet. Luckily, there are ways to get those healthy nutrients without having to cook elaborate dishes or carry a lunchbox filled with fruit and vegetables everywhere you go. Welcome to Healthy Food Tribe! My name is Donna and with my blog I hope to offer you tips, news, trends and lots of information about healthy nutrition, healthy lifestyle choices and green living. Please note that I occasionally endorse products for which I may receive a small commission at no extra cost to you. Join a community of health-minded people by subscribing to my newsletter! © 2019 Healthy Food Tribe | We are a participant in the Amazon Services LLC Associates Program, an affiliate advertising program designed to provide a means for us to earn fees by linking to Amazon.com and affiliated sites.